Minion mania is expected to hit Stanborough Park on the 3 August as the borough’s biggest community event returns. The activity programme for PlayDay 2016 has been finalised and includes dodgeball, ultimate frisbee and football in the ‘pop-up’ street stadia from Child UK. There’ll be yoga from Tatty Bumpkin and a fitness session from Powerhoop on the main stage, as well as karate demonstrations and farm animals at the other end of the park. Creative Hertfordshire will be running all kinds of arts activities to encourage creative sides to shine, or if you’d like to inspire a generation of future musicians you can get involved with musical play. There will be a climbing wall and bungee swings for kids with a head for heights; music and dance workshops, including Bollywood and street dancing; and, of course, the Minions, who will be around to meet and greet little ones, have photos taken, and inject as much silly Minion-humour into the day as possible. A selection of tasty food will be on offer, including pizza and ice creams, as well as a stall from popular local company, Now Now South African Food. There’s also a large picnic area to sit-back, relax and grab some refreshment. A drop-off point will be located in the Stanborough Park South Car Park. Parking provision has been increased, but is still limited, and residents are encouraged to walk or get public transport to the site, where possible. 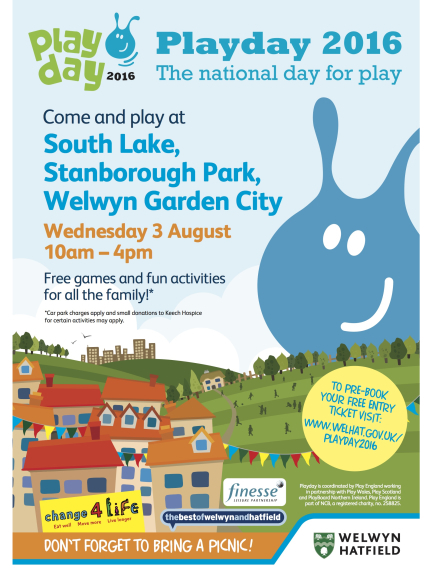 For a full list of car parks and to book free tickets visit www.welhat.gov.uk/playday2016. Booking a ticket is highly recommended to avoid disappointment should the event reach maximum capacity.